Do You Stand While You Play The Switch? 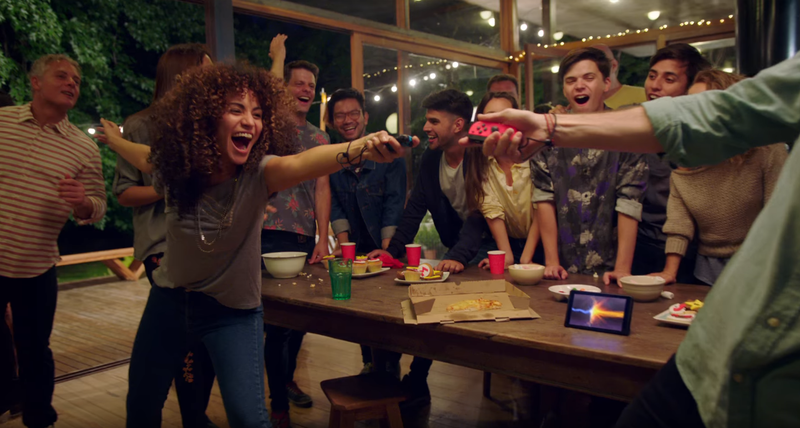 At my birthday party this weekend, I brought out my Nintendo Switch so I could be as cool as all those people in the commercials. Just like the people in the commercials, we all ended up standing while playing games, as well. It was super weird. On Saturday night, after I hooked up my Switch to my roommate’s projector, I made sure to find every free chair in the house so that people would feel compelled to play. But when the party finally transitioned into drunk Mario Kart, no one sat down. It didn’t strike me as unusual until my friend tapped me on the shoulder and pointed at a couple of people clutching JoyCon, standing in front of the semicircle of chairs and couches I’d arranged. It was pretty much just like this. Sitting while playing games is my default. If I’m going to go dig for fossils in Animal Crossing on my 3DS, I want to be as comfortable as possible. Sitting while playing non-portable games is a no brainer. While I’m no longer tethered to my TV by wires, if I’m going to be shooting aliens in the head in Destiny 2, I’m gonna be sitting for several hours. Not so with the Switch, apparently. Even I stood while playing Mario Kart. I didn’t even realize I was doing it. When I had the JoyCon in my hand, it just felt most appropriate to get as close to the projector screen as I possibly could, which meant that rather than parking my booty in a chair, I stood up. Did I learn this from the commercials, or is this just a better way to play games on the Switch? Has anyone else witnessed this phenomenon? Do you sit or stand when you play Switch games? Sound off in the comments.